High-profile horror projects have become a bit of a bigger thing at San Diego Comic-Con in recent years and, as such, Lionsgate decided to bring Jigsaw to the big event. The Saw franchise has been dormant for seven years, but it is about to make its triumphant and bloody return this Halloween. The big question is, will Tobin Bell's John Kramer be resurrected somehow? This latest poster certainly seems to be teasing his presence in Jigsaw. 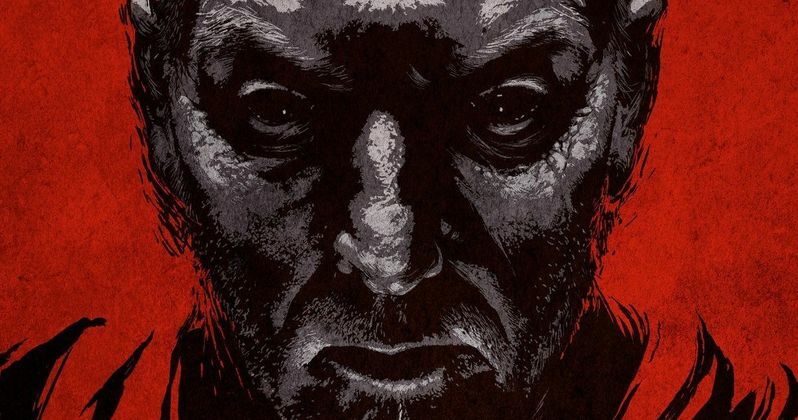 During the weekend at San Diego Comic-Con, Tobin Bell was at the event to sign some of these new exclusive posters. Luckily, the Saw Movie Twitter account shared the poster for everyone to see. Though, if you want to actually get your hands on one of them that may be a bit more tricky. In any case, the poster is black and red, featuring John Kramer in all of his twisted glory above the title Jigsaw. It is a great poster, but it does raise some interesting questions about Saw 8. "Meet John Kramer himself, @officialtobin, & get your #SDCC2017 exclusive collectible #Jigsaw poster signed today at 1-2pm PT Sails Pavilion." The studio has been pretty tight-lipped on the plot details for Jigsaw up to this point, but the first trailer gave us our first real look at Saw 8 and some of the story elements. Bodies start turning up all over the city with Jigsaw's mark clearly left all on them. Is it a copycat? Things get tricky when his DNA and some audio recordings of the famed killer start turning up with the bodies and at the gruesome sights of these twisted games. The begs the question; is Tobin Bell's John Kramer going to actually be alive in Jigsaw? Those who have followed the Saw franchise will note that John Kramer died in Saw III. Tobin Bell has reappeared in flashback sequences and things of that sort, but he has most definitely been dead. So how is it that the famed Jigsaw killer could come back in this installment? Could things be getting a little supernatural with some sort of resurrection angle? That would be pretty bizarre, but we can't rule it out. Either way, John Kramer is clearly going to be a huge presence in this movie, dead or alive. Jigsaw is set to arrive in theaters on October 27 and since it is going to be the biggest horror release for Halloween weekend, Lionsgate stands to make a killing on this thing. If directors Peter Spierig and Michael Spierig (Daybreakers, Predestination) managed to actually make a good movie, this could wind up being a massive hit. We'll soon find out. In the meantime, check out the brand new trailer for Jigsaw for yourself below and speculate away in regards to how John Kramer will be featured in the movie.